SOUTH BEND, Ind. (CNS) — The Women’s Care Center, a nationwide network of pregnancy resource centers that began in 1984 with one location near the University of Notre Dame’s campus, has been named the recipient of the 2019 Evangelium Vitae Medal bestowed by the university’s Center for Ethics and Culture. The recipient is announced annually on Respect Life Sunday, which this year was Oct. 7. The award, comprised of a specially commissioned medal and $10,000 prize, will be presented at a Mass and banquet April 27 at Notre Dame. “The Women’s Care Center sets the standard nationwide for compassionate and comprehensive care for mothers, babies and families,” said O. Carter Snead, the William P. and Hazel B. White director of the Center for Ethics and Culture. “In its work and witness, the Women’s Care Center embodies the unconditional love and radical hospitality that anchors and sustains a culture of life. It is our privilege to honor them with the Evangelium Vitae Medal,” Snead said in a statement. The Women’s Care Center opened its first location immediately south of the Notre Dame campus. In the past 24 years, it has grown to 28 pregnancy resource center locations in 11 states and serves more than 26,000 women annually, making it the largest network of pregnancy resource centers in the United States. 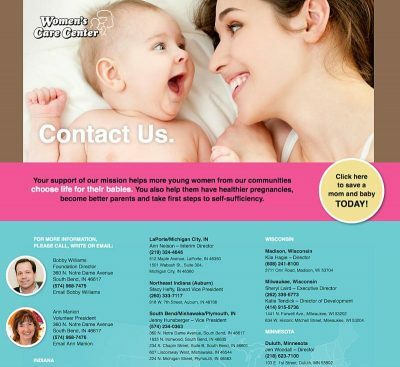 The Women’s Care Center provides free, confidential counseling and education to women facing unplanned pregnancies, as well as ongoing support, including parenting classes and referrals for mother and baby wellness care. The center has locations in Florida, Illinois, Indiana, Kentucky, Maryland, Michigan, Minnesota, North Dakota, Ohio, Pennsylvania and Wisconsin. “The Women’s Care Center gives women in crisis the support they need for themselves and their children before and after birth,” said Holy Cross Father John I. Jenkins, who is president of the University of Notre Dame and a board member of the Women’s Care Center Foundation. “On behalf of our counselors, nurses, sonographers and the entire Women’s Care Center family, we are deeply grateful for this recognition, which will advance our life-saving mission to pregnant women in 11 states,” she said. The 2018 Evangelium Vitae Medal recipient was Mary Ann Glendon, the Learned Hand professor of law at Harvard Law School and former U.S. ambassador to the Vatican. Previous recipients include the Jerome Lejeune Foundation; Richard Doerflinger, now-retired associate director of the U.S. Conference of Catholic Bishops’ Secretariat for Pro-Life Activities; Helen M. Alvare, professor of law at George Mason University; Mother Agnes Mary Donovan and the Sisters of Life; U.S. Rep. Chris Smith, R-New Jersey, co-chair of the Bipartisan Congressional Pro-Life Caucus, and his wife, Marie Smith, director of the Parliamentary Network for Critical Issues; Supreme Knight Carl Anderson and the Knights of Columbus; and the Little Sisters of the Poor.